The classical teaching holds that isolated spinal epidural hematomas are venous hemorrhages, and no angiographic investigation is warranted. This is certainly true in the majority of cases, especially when supported by typical history of an elderly individual on various anticoagulation / antiplatelet medications — most often Warfarin. However, one must always be cognizant of exceptions to every rule. 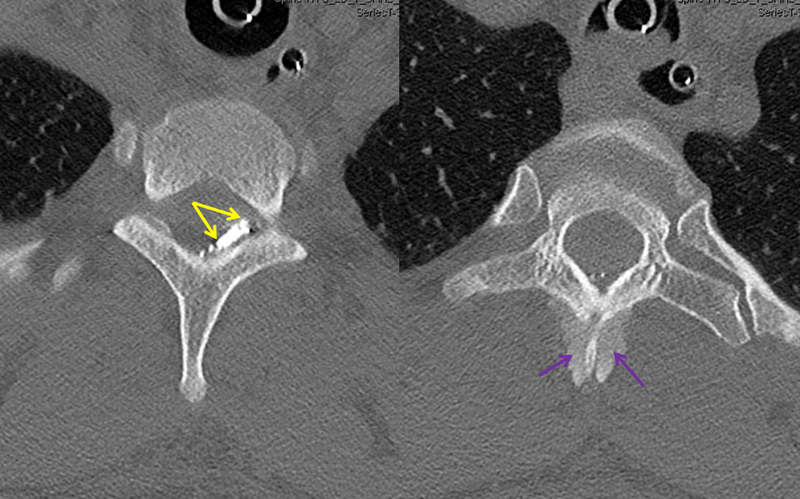 This young person presented with 1 week of new and severe upper thoracic neck pain, followed by sensory / proprioceptive deficits in the lower extremities. Motor and bowel/bladder functions were intact. 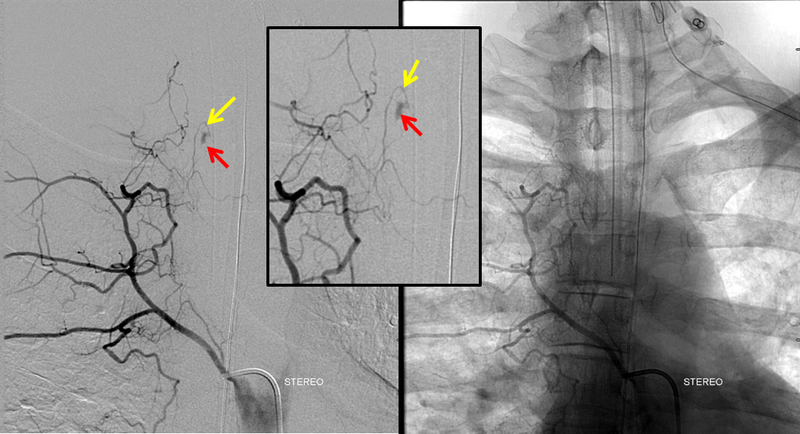 Arch injection demonstrates contrast collecting over the upper thoracic midline (red) in late arterial phase, washed out by the venous phase. 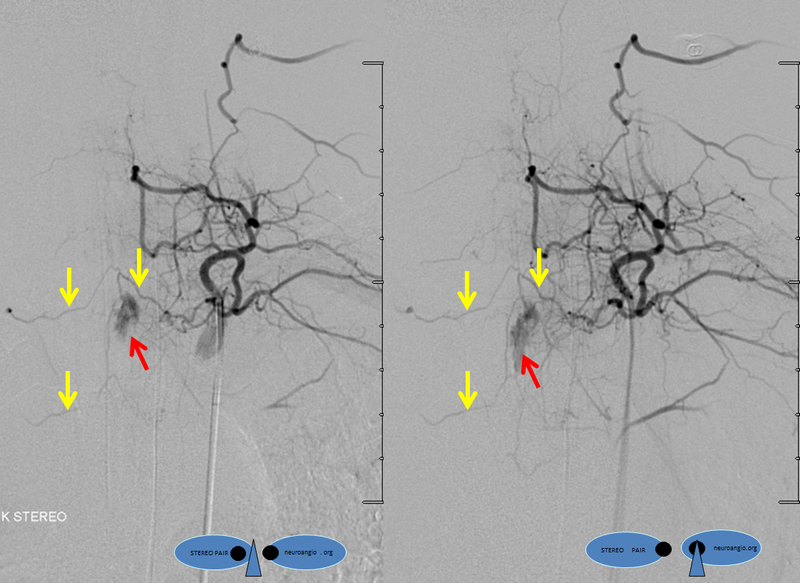 Subselective Marathon catheterization of the right T2 epidural branch, the dominant feeder, in a flow arrest (wedge) position demonsrates AVM microanatomy. nBCA is the embolic material of choice. 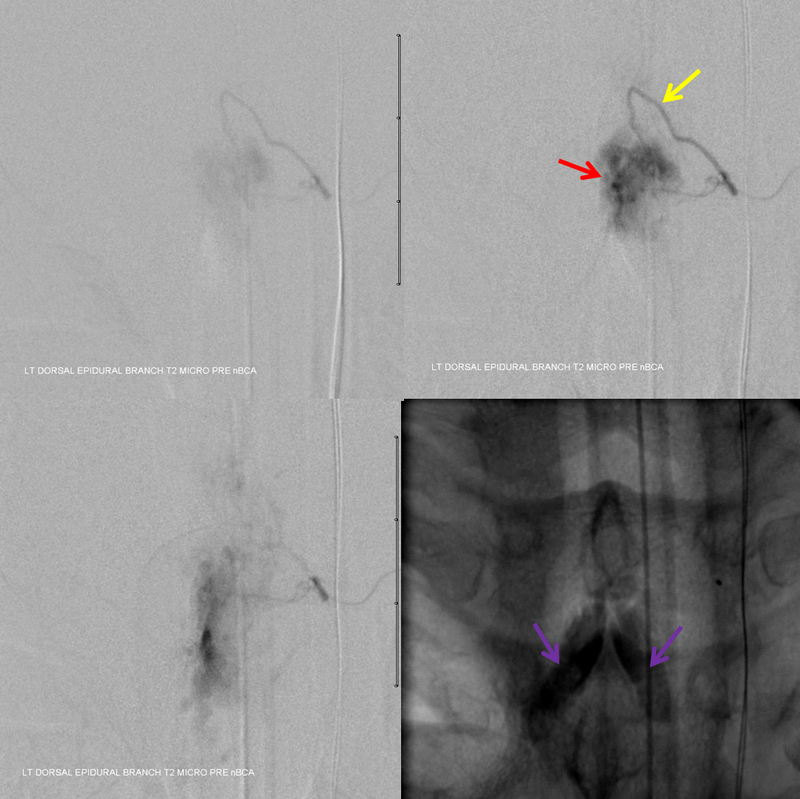 Complete penetration of the nidus is achieved, with reflux into regional epidural network to seal off collaterals. Check out this !STEREO MOVIE! 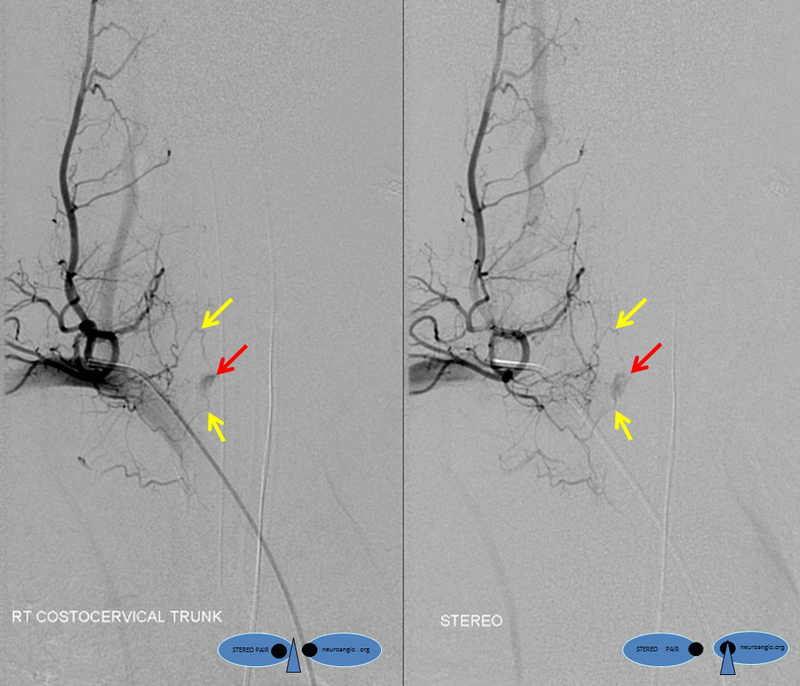 of pre-op imaging and non-stereo nBCA injection. Notice on the micro run how much larger the AVM is than the epidural space, extending to the paraspinal muscular space where prominent vascular channels were first seen on the MRI. The nBCA injection only penetrates the epidural space. A “glob” of glue during the injection is likely the rupture point, now filled with nBCA. According to Prof. Willinsky (see article below), one must be careful of mass effect from nBCA in the epidural space. 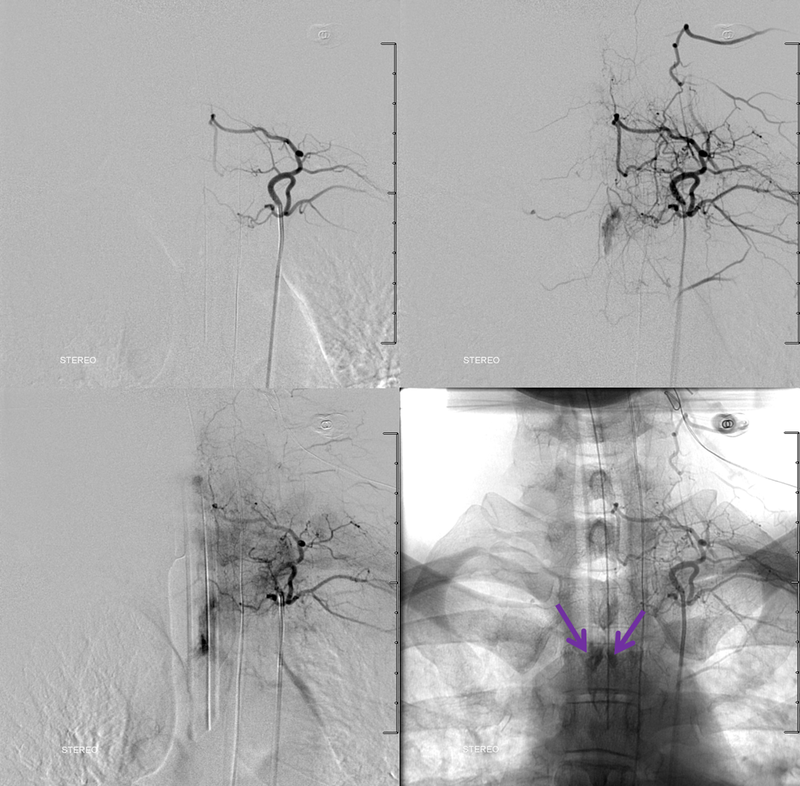 Patient is taken to OR immediately after embolization for planned decompression (post-procedure neurologic exam was at baseline). Clinical outcome is excellent.